Sample the work of the creative Panto Stock designers, an award winning team of artists, digitizers and programmers. 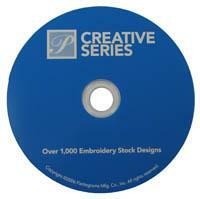 The Development Department creates these wonderful stock embroidery designs, fonts and home embroidery software products. This is the Panto Creative Series, a collection of one thousand plus unique professionally digitized designs in .DST format.